A strong low-pressure system roared up from the Southeast overnight, dousing the region with a cold, drenching rain. Howling winds whipsawed the trees in my backyard, their bare branches backlit by flashes of lightning. Thunderstorms in these parts in February are rare, or were. Across town, roads were blocked by fallen trees, and many neighborhoods lost power. Nowadays, each passing storm extracts its toll on a century’s worth of suburban tree growth, and the trees that do fall victim are often the ones poised to do the most damage — those along streets lined with utility wires. Some are demasted, their top-heavy trunks snapped clean off, while others are upended whole, root ball and all. Seeing a tall tree arching far overhead, the mind wants to picture a matching tap root extending as far and wide underground, but it often amazes me how perilous the purchase of an old tree is, a three-foot-wide trunk supported by the sketchiest of root structures. If a tree falls in the forest, no one hears it, but when it falls across a road and a power line, everybody hears the utility crews the next day, sawing it up and carting it away, and reconnecting the power cables. The trees in my yard are mostly unscathed, but not before getting a haphazard pruning that has sheared off a copious amount of small branches and limbs. That which doesn’t kill you, makes you stronger. The trees in my yard rely on these windstorms to shed the new growth they can’t support, culling the old rotting branches they can, and must, live without. By morning, a bright and sunny Saturday, the storm has passed, and the warming powers of the late-winter sun draw me outside, mostly to pick up sticks from across the yard. I grab the leaf rake from the shed and pull the small green tarp from off the wood pile. About 3 ft wide by 4 feet long, the heavy-gauge plastic is ringed by grommets through which a small rope passes. The rope allows me to bind up the tarp and use it as a sled. Arborists consider the sycamore a junk tree, and woodcutters have no use for it. I have two on either side of my property. Sporting pretty, dappled bark and firmly rooted in the ground, the sycamore is an attractive tree, but it’s particularly messy. The largest hovers over my neighbor’s driveway, and this morning I stray over the fence to rake up the twigs, bark, branches and copious amounts of fluffy brown seedballs that have rained down through the storm. My neighbors are in Florida for the month, snowbirds waiting out the worst of the New England winter. I swipe the broken twigs from the top of their car and off the windshield and pile the tangly tree debris on the tarp. I drag the sled past my pile to the heap of branches and prunings I keep under the pine tree in the corner of my yard, close by the street. Some of the sticks I break into pieces and burn in the backyard firepit, but most of these trimmings get carted off to the town’s yard refuse center a couple times a year. The trees in my backyard shed branches throughout the year. Some are burned as kindling, but most get hauled off to the yard-waste dump. The small tarp and its cottony cousin — the old tattered bedsheet I use to gather up fall leaves — are just part of the collection of tools and implements I’ve assembled over the years to tend my backyard and compost heap. Most of the tools hang on hooks on either side of the double doors, within easy reach. There are many kinds of rakes, but I’m partial to the old-school metal-tined variety, which is particularly good for teasing out leaves from underneath bushes. The flat-tined bow rake is for heavier tasks, including re-arranging the salt marsh grass hay atop of my pile. A good spade is an essential garden tool, of course, and so is the wide-mouth scoop shovel, which I use mostly for moving snow and wood chips. The edges of the aluminum flange are worn razor-thin and peel up at the end corners, the result of countless scrapings over ice and asphalt. Every couple of years I pound the curled-up edges flat with a claw hammer. I like the fact that in some parts of England a pitchfork is known as a prong, and in parts of Ireland, a sprong. I rely on two types, one with five rounded, curving tines. Sometimes called a manure fork or a hay pitchfork, it’s designed for moving clumpy, bulky stuff like straw or wood chips, or compost. It’s ideal for grabbing and turning masses of leaves, though sometimes not without a struggle. My heap of composting leaves being denser than most haystacks or the bedding of a horse stall, the pitchfork sometimes gets stuck with a clutch of impaled leaf mold. the mix. A pitchfork isn’t designed to work in reverse, and tugging it out of a clutch of mashed-up leaves has caused the pronged metal head to detach from the wood handle. A wooden golf tee hammered into the joint serves as a shim. The strength of that splice pretty much matches the load my own joints can bear in twisting or turning my pile. Better it fail than my back. It’s the workhorse tool for my pile, and I rely on it to dig through my pile and distribute gobs of leaves and such until the finished compost sifts through the tines. When I have to trade the manure fork for the spade to sort through my pile, I know the compost is done. The tools I use to tend to my pile. Some of my tools are store-bought, but the ones I prize are garage-sale finds, made in sturdier times and well used. The latter describes the two other pitchforks I own. Both have four flat tines. This type is often called a garden fork, and I use it to tease out the most compressed leaves from the sides of my pile, or to twist and turn the tines into a hole in its midst to mix things up. I keep them both outside the shed and within reach of my pile, and as a result the wood handles are deeply weathered, the iron rusted. I also use the garden fork as a spade, to tease out the roots of a perennial for transplanting. In spring and fall I also use the garden fork to aerate patches of the lawn, stepping on the crossbar to plunge the tines up to the hilt. Each step creates four, 9-inch deep holes that jab through the hard-packed subsurface crust that often forms underneath turfgrass roots. Stepping on the garden fork a couple dozen times punctures a patch of lawn, allowing rainwater and air to permeate down through a rich column of microbial activity to the water table below. It’s good exercise, and such deep-tine aerating is the secret, I believe to healthy turfgrass, especially in high-traffic areas like my backyard. The myriad micro-holes, which are surely soon filled with the old grass clippings, chopped leaves and humus that I scatter across the ground, must be like so many pixie sticks for grazing worms. This sort of poor man’s lawn aeration leads each spring to a bounty harvest of my backyard’s most reliable, the Connecticut potato. That’s what locals call the small rounded stones thrust up by the freeze and thaw cycle through the silty, sandy subsoil deposited by glaciers that gouged their way southward across this land 10,000 years ago. I gather wheelbarrows full each spring, and fill in the voids the larger stones leave with spade fulls of compost from my pile. The steel tines of both garden forks are now slightly crooked, bent from probing for and plucking out scores of these stones. Having given my pile a top-level turn when I stuffed it full of fresh compostibles a week ago, I have no big plans to take a deep dive today. But I can’t resist prodding my pile with the manure pitchfork. I plunge the bended tines through the crusty outer layer of leaves, teasing the mix up and out of its repose. This fluffing up will allow my pile to take shallow gulps of air, at least, and to be able to soak up more rain, which is on the way. A few thrusts of the rebar rod also help to infuse the inner reaches of my pile with deeper drafts of air. “Every block of stone has a statue inside it and it is the task of the sculptor to discover it,” said Michaelango. The ribbed iron bar pokes through the compressed leaves to reach the ting of hard ground. I remove my glove to check the temperature of the metal probe. It’s warm to the touch. The poke holes will be conduits for air and water and the unseen creatures that are reshaping my pile from withi to turn a mass of dead leaves and other organics into finished humus, renaissance sculptors if ever there were. The lineup of composting tools, ready for spring. My pile is a homegrown solution to a global problem — climate change caused by man-made increases in greenhouse gas emissions. True, the vapors ever-rising from its midst are proof that my pile passes a lot of gas of its own making. 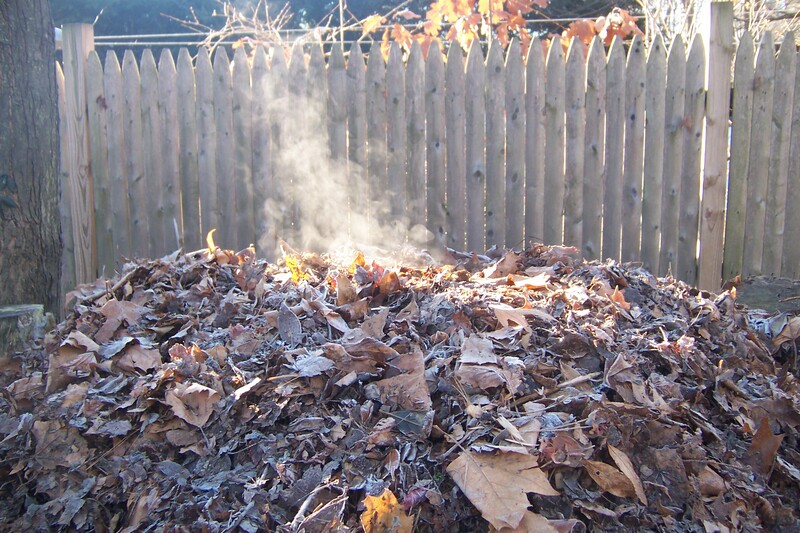 My pile is, after all, a hot mess of carbon-laden leaves spiked with nitrogen-rich combustibles. Its main purpose in life (and death) is to break down complex molecules into more elemental, reusable parts, as quickly and robustly as my meddling efforts make possible. A byproduct of that energetic process is greenhouse gases, mostly in the form of carbon dioxide and no doubt some methane as well. A classic view of my pile in action, this on a frosty fall morning. Ever-increasing levels of those noxious fumes are now playing havoc with what has been a very human-friendly climate these past few millennia, give or take an ice age or two, or even this long slog of a snowbound winter. But here’s some research from an EPA report from 2010 that supports the value of a compost pile as a way to lock up some of that excess carbon dioxide or otherwise offset its potentially ghastly effects on our environment. Living as I do in a fully four-season climate, hard by the intricate meeting of saltwater and shore, the weather forecast is a constant reminder of how delicate the balance is between comfort and crisis, near term and long. I’ve extracted a few relevant bits from the footnote-laden report, but the conclusion to me is that my pile saves more energy and stashes away more carbon than it gives off in excess greenhouse gases. 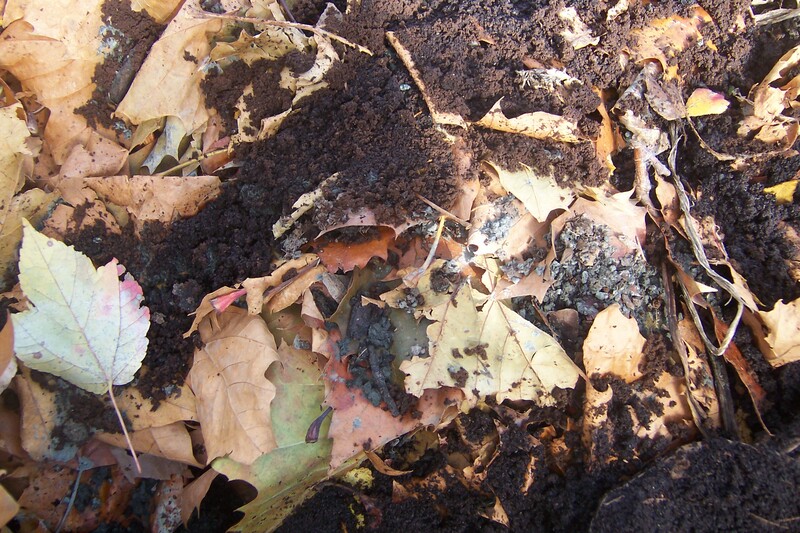 “This guidance document describes the development of composting emission factors for EPA’s Waste Reduction Model (WARM). Included are estimates of the net greenhouse gas (GHG) emissions from composting of yard trimmings and food scraps, as well as mixed organics. …. During this decomposition, approximately 80 percent of the initial organic matter is emitted as CO2. The remainder of the organic compounds eventually stabilize and become resistant to further rapid microbial decomposition (i.e., recalcitrant). …. Significant evidence exists that compost contains stable compounds, such as humus, and that the carbon stored in that humus should be considered passive when added to the soil because it breaks down much more slowly than crop residues. …. Although EPA understands that generally compost is applied for its soil amendment properties rather than for pest control, compost has been effective in reducing the need for harmful or toxic pesticides and fungicides. On a modest backyard scale, my pile is a farm factory. Its end product (more like a beginning) is humus, loaded with stable carbon molecules and other nice-to-have nutrients. These reconstituted elements are bound up in a loamy matrix of organics, teeming with life. This rich mix of newly made earth has a multiplier effect when spread across the land, leading to other eco-friendly results with lasting benefits, like more plant growth (photosynthesis = oxygen ), less water use and reduced need for chemical fertilizers and pesticides. I am a compost farmer as much as I am a suburban dad who keeps a nice lawn for the kids to play on and a garden with fresh organic vegetables to put on the table. My pile is my back 40, and its yearly crop of rich dark compost, teeming with life and recycled nutrients, chief among them repurposed carbon, is what makes my garden and lawn so prolific in the six months of the year when our world is green and growing. My pile, a hot mess of carbon processing. It’s a backyard factory that produces rich new earth. Ohlson makes the case that composting on a scale both large and small is one of the most effective, scalable ways to reduce the amount of carbon emissions entering the atmosphere. Other scientist writers, such as David R. Montgomery in Dirt: The Erosion of Civilizations, and Jared Diamond in Collapse: How Societies Choose to Fail or Succeed, have made similarly convincing arguments that when a civilization’s soil goes bust, that culture is toast. “Ohio has lost 50 percent of its soil carbon in the last 200 years. But in areas of the world where cultivation has been going on for millennia, soil carbon depletion is much higher – up to 80 percent or more. Altogether, the world’s soils have lost up to 80 billion tons of carbon…. Even now, land misuse accounts for 30 percent of the carbon emissions entering the atmosphere,” writes Ohlson. 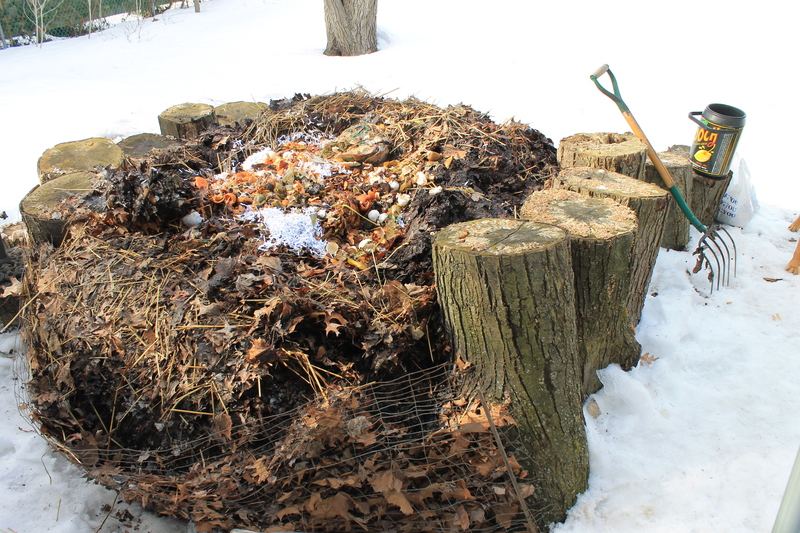 To shift from thinking globally to acting locally, so about how much does a backyard compost pile contribute to carbon sequestration? The best account I can find is an article on The Global Citizen website by Donella H. Meadows, an adjunct professor of environmental studies at Dartmouth College and director of the Sustainability Institute. In “How Much Greenhouse Gas Does Your Garden Cut,” she relates relates some number-crunching done by Dr. Jonathan Foley, an environmental scientist at the University of Wisconsin, for his brother David’s .4 acre organic garden — a plot about the size of my backyard. Over 10 years of composting and other sustainable gardening practices, David and his wife, Judy, have increased the the percentage of organic matter in their communal garden in Maine from 1 percent to 7.7 percent. That impressive boost translates to an increase of 2.2 pounds of carbon in every square foot of their garden. Add it all up and, according to Jon Foley’s back-of-the-envelope calculations, his brother has removed over 38,000 pounds of carbon from the atmosphere — 19 tons — over the past 10 years. My pile and backyard garden are surely of a more modest scale than the Foleys’ communal efforts, but composting surely reduces my carbon footprint in similar ways, and that’s a good step in the right direction. The warm spell continues, producing a weekend of springlike conditions. 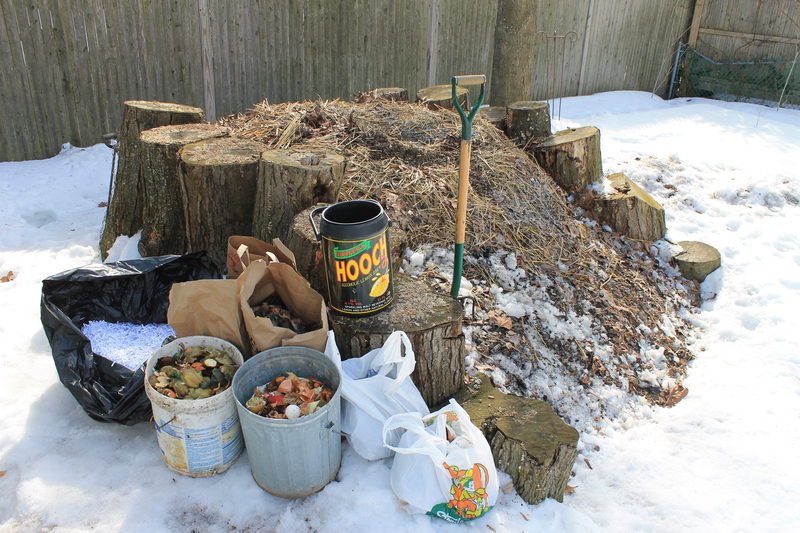 My pile is fast shedding its winter cloak of snow, and today, a Sunday, I will take advantage of the February thaw to prime my compost heap with a bounty of fresh compostibles. The middle of my pile has sunken into itself. The backside wire fence strains to contain the stack of freeze-dried leaves squashed up against it. A swath of drifted snow turned rotted ice nestles along the backside of my pile, soaked further by a winter’s worth of pee. Patches of snow hold out in the crevasses of the log walls like retreating glaciers, and the north-facing front remains a frozen mat of crusty, frozen leaves. It dawns on me that the reason my pile has looked so diminished of late is that I’m standing on a foot of packed snow that surrounds it, looking down on it from that much higher. Subtract that misstep and my pile has suddenly grown much in volume. My pile is primed for spring. A winter’s worth of cached green energy will soon help fuel its inner fires. Soon it will grow more. I have several bags of kitchen scraps in cold storage in the shed, and I know my neighbor’s compost bins are chockful as well. I also have a lidded ash can crammed with more coffee grounds from the closest Starbucks, a plump plastic bag full of shredded office paper and two plastic bins of salt marsh hay scooped up yesterday from the local beach. In all, I have 50 pounds or so of a variety of high-octane “greens” to stuff into my near-dormant pile, a haul that will surely help nurture it along through the waning days of winter. Hemmed in by the weather these last few weeks, I’ve dipped into the cyberworld of composting, googling “Winter Composting” to stay attuned to my pile, if only virtually. Near the top of the list is a helpful overview from organic gardening.com. The internet is one big compost pile itself, the digital humus of humanity. True, there are parts of the worldwide web that are toxically anaerobic, and stink about as much. But there is much fertile, active stuff worth digging through. In “Cold Weather Compost,” Genevieve Slocum writes: “Even in winter, a compost pile is alive, an ecosystem in flux.”Microorganisms such as bacteria, fungi, and actinomycetes account for most of the decomposition activity in a compost pile,” explains Dave Wilson, research agronomist at the Rodale Institute. The microbial action in decomposition is exothermic, which means that heat is a by-product of the chemical process of breaking down the material. With so much chopped fodder for my pile on hand, I have plans to dig even deeper. With the front and back of my pile frozen thick and the center caved in on itself, I decide the best approach to the first pre-spring “turn” of my pile is to excavate the core. Standing atop the log walls, I use the hay pitchfork to spear clumps of the dankest, fulminating parts of my pile, and pull them out toward the edges, tossing and turning the collection as I go. It’s like strip mining in reverse, carving out chunks of leaf mold and composted kitchen greens from within my pile and stacking them up, out or to the side as efficiently as possible. Poking across into the center of my pile through the tangle of seagrass stems at its top, I spot a fuzzy yellow green tennis ball, giving me the real reason for my dog’s nuzzling around my pile all winter; he’d lost a ball in snow long ago and like an old bone hadn’t been forgotten. I dig down through my pile, turning up and over the detritus from the deposits from a month ago, before the snow started falling nearly a month ago. Most has already been consumed by the digestive process of my pile. The pitchfork tines hook on a scrap of coffee filter here, poke a half eggshell there. I turn up a small plastic container cup, like the kind you get cream cheese in, likely tossed into the container the neighbors keep. It was already packed with a humus-like loam, which I fleck out with a tap against the log wall. I burrow as far as my hay pitchfork and straining back will allow, clearing out a bathtub-sized space in the center of my pile. At the bottom is a tangled mess of wet, pressed leaves. It’s cool to the touch, but I’m pleased to see a clutch of fat red earthworms glued stiff to the underside of a clump of bound leaves. Holdouts or pioneers, I don’t know, but they will soon be richly rewarded with their perseverance through the rigors of winter. With the new addition of shredded paper and coffee grounds to my pile, it will be a good year for earthworms, I think. I fill the hole first with fluffy gobs of the julienned strips of crinkly white paper, then add half of the kitchen slop and rabbit poop, two buckets’ worth. I mix a bit with the pitchfork, then backfill with forkfuls of frozen chunks of leaves from the backside. The pit mine of my pile is filled with fresh green fixin’s and freeze-dried leaves from along the backside. I dump the rest of the shredded paper atop the deep layer of leaf mold, sprinkle in the coffee grounds and mix in the remaining kitchen scraps. I bury this second layer of greens with a crown of clumpy frozen leaves from along the backside of the fence.I have enough coffee grounds to be generous, and take several scoops with a garden trowel to sprinkle the pressed granules directly over decaying leaves that surround the stems of the azalea bushes in the perennial garden. As a finishing touch to my pile, I add a heap of the salt marsh hay across the top. I figure this will be the “last straw” for my pile. The topping of rotted stems and flecks of seaweed and bits of shells will help insulate my pile through the remaining days of winter. But it breaks down slowly, require more time to decompose fully. The next time I toss and turn my pile, I will fold the straw into the mix, allowing it to serve as tangly fodder for the heap on through early spring. It short order, my pile is restored, pumped up and primed for action. Newly enriched by the stored-up green fixin’s and such, I expect my pile to soon heat up with a serious case of spring fever. In time, I will further turn and shape and feed my pile and give it a full airing as spring finally arrives, but this first “shock and thaw” will reignite its inner fevers. A wet, warm weather front has blown up from the south. First fell pebbly granules of ice, before being replaced by a steady rain that melted the remaining snow cover into sheets of water on frozen ground. From the kitchen window, my pile looks a cold, sodden mess. The slick conditions keep me indoors on a Saturday morning, except for a trip to the side of the shed for an armful of firewood of the fast-dwindling stack. A winter of record highs and record lows whipsaw my pile. It trundled along nicely through an unseasonably warm December, the mild temperatures allowing me to stoke it with infusions of both brown and green materials. It’s since been buried by several deep snow falls, deep-chilled by sub-zero temperatures, now soaked by a chilling rain. My pile takes what comes. Some winters there’s hardly any snow cover in these parts, especially here along the shoreline of Long Island Sound. I’ve played golf at the local course in Februaries past. Old-timers hereabouts talk of the Sound freezing thick enough to walk across the water to Cockenoe Island, a small spit of land a half-mile offshore. I can’t imagine such a stretch of saltwater freezing in this day and age. It may be due to the normal swings in cyclical weather patterns we are just now beginning to identify, if not fully understand. We may be playing out another plot line of human-induced climate change, that of more extreme weather. Last winter my pile was hidden by snow for a solid two months; this season, not so much. Across the garden beds, slender green shoots of daffodils and crocuses poke up from the hard-crusted ground of frozen wood chip mulch, a full month ahead of schedule. Before I gather an armful of firewood, I press my hand against the crust of leaves atop my pile. It’s as stiff as cardboard and resists like a firm mattress. The waxy coating of leaves have no doubt helped shed some of the snowmelt and rain and, frozen together in a layered matrix, surely have insulated the material below. I notice a shimmering of air rising from the front center of my pile; not vapor but a hint of heat. That’s a good sign. “The National Weather Service released its “long lead seasonal outlook” that in a nutshell says above normal temperatures will continue through the end of May. The reason is the same one we’ve heard before: a strong El Nino that’s warmed water temperatures in the Pacific Ocean that’s affecting storm systems, the jet stream and the storms that make their way to southwest Connecticut. Above normal temperatures have been the norm for most of the year. Last year we saw the warmest Christmas Day day on record. Bridgeport and Danbury both hit 64 degrees, easily breaking the previous record of 59 degrees set in 1964. In fact, the 64 degrees that Bridgeport reached on Christmas Day was the warmest day of the month. On average, December’s average temperatures are 11.8 degrees above nornmal, according the the NWS. As I wait for my pile to thaw, I leaf through the years of my compost journal and come across an entry from a February weekend five years ago. I recall the season fondly as the dog’s first winter. It was also a time when my pile was still a place of action and intrigue for my young son, then eight years old. 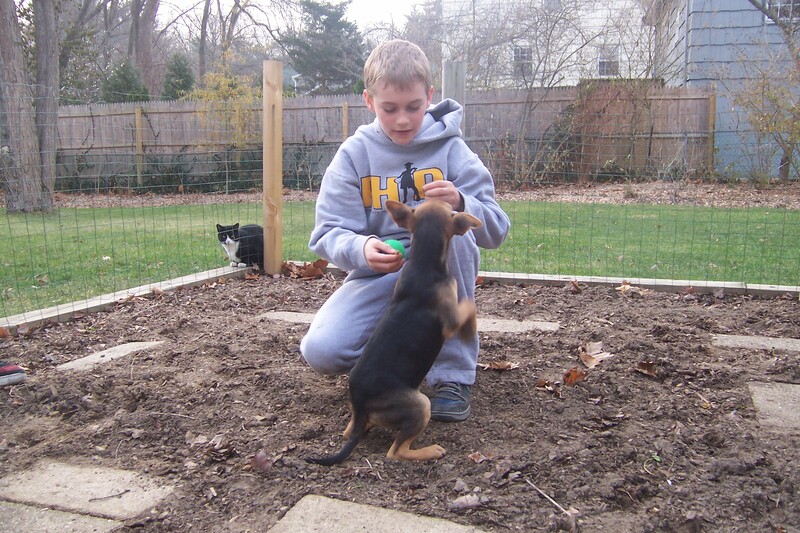 Cole and Miller as a pup in our vegetable garden in December 2011. Tuffy the cat observes. In the fall, Cole would jump off the log walls to disappear into a freshly assembled pile of leaves. One winter we created a snow ramp for him to slide a saucer down the face of the pile, and out along the bench of a picnic table. In spring, we’d gather his friends to dig up handfuls of squirming worms from the pile, to set on hooks for bluegill fishing in a nearby pond. One summer we unearthed a garter snake, another time set free the jumping woodland mouse. My pile also made a fine backstop for plinking soda cans with a BB gun, and for stopping baseball throws that got by the old man. As long as little boys are made of snips and snails and puppy-dog tails, my pile was our touchstone. Feb. 18. It’ll be nearly 60 degrees today, after balmy weather yesterday of nearly 50. Snow still covers the lawn, but my pile is now topped only by patches of stiff meringue. I scrape across the top with the tines of the pitchfork, etching the snow like frosting on a kid’s birthday cake. The front, northern slope of the pile is still frozen and hard to the touch of the tines, but the top is melting rapidly. With my son and puppy in tow, I retrieved the two bags of old kitchen slop from their hooks in the shed, plus a mostly full container from inside the house. The puppy scaled the pile from the front, and my son climbed up the left log wall, balancing with the old straight-tined pitchfork. I walked to the backside with the curved hay pitchfork and tunneled into the middle, heaping forkfuls of steaming leaf mold to the side. Cole was the first to spot the surprise of flesh-colored worms after the first couple forkfuls. Earthworms are the Goldilocks of my pile, occupying a space that’s not too close to the frozen edges, nor too near the hottest spots of fermenting kitchen scraps. But in just the right spot, there will be hundreds of them. We’re delighted to see them, and even the puppy takes a sniff. It’s a chore to extricate the pitchfork fulls from the pile. The matted leaves are compressed together, and my wrists are weak. I tunnel down just deep enough for Cole to pour the bags of kitchen slop in; going deeper would have required much more effort, and I could tell I was getting down to a layer that had frozen from below or was simply matted together to the point of impermeability. Cole nicknamed the steaming hole ‘the volcano,’ and we peered down at the ghosts of meals past – edamame shells from early in the new year. A final glimpse of bright orange Del Monte tangerines in syrup that he’d only had one helping of before we’d forgotten about them in the back of the fridge. The leftovers disappeared quickly, and I supervised Cole in twisting the pitchfork into the mix. With my curved pitchfork I speared clumps of dried leaves from the wire-fence back of the pile and the corners, where the whole leaves get tucked between the biggest logs and the wire. In they went on top of the ‘greens’ I told Cole about. We mix new green with old brown, and then back fill with the sodden mix of interior leaves coated with old coffee grounds. 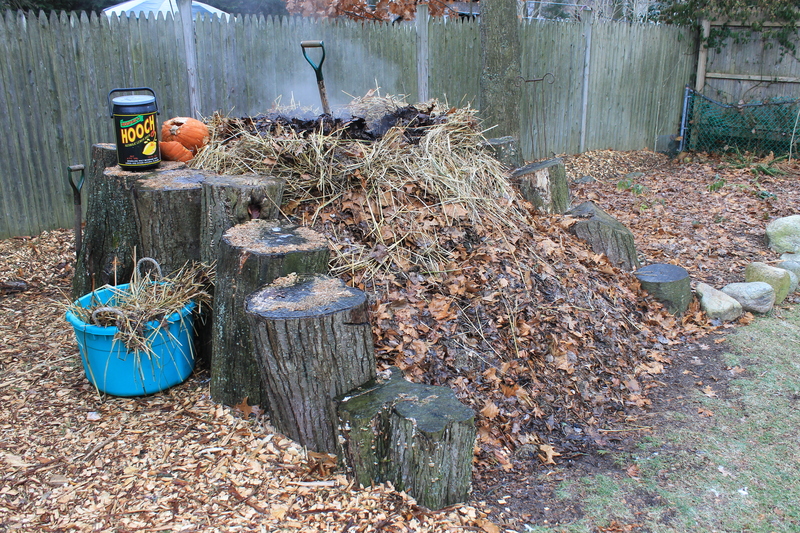 I finished by piling up a foot tall-topping of old wet leaves above our filled-in hole. It’ll be a totem for me to track, to see how much it sinks in. The rest of the pile remains unto itself, undisturbed. I can’t wait to give the pile a thorough tossing. I feel the same way this year. I make plans to bolster my pile with several weeks’s worth of compostibles and other additions and to give it a good tossle. The dog still takes an active interest in all things I do outdoors, but these days my teenage son views my pile in about the same way as he does a Facebook page – it’s now the old man’s domain. Still, I use my pile when I can to bring relevance to his STEM homework. I steer conversations toward helping him develop an interest in ecology, hydrology. It’s his generation that will have to develop new green industries to mitigate the problems of rising sea levels, address the paucity of productive soil, the need for clean energy or fresh water or any of the other mounting problems that grown-ups of his time will have to face. My son recognizes that my pile is in part a connection to our family roots as Midwestern farmers and ranchers. He will never experience the summers I did spending time exploring my grandfather’s Nebraska farm. But still, he’s got the compost pile in the backyard and has whiled away more than a few Connecticut winters plotting with the neighbor girls how they will grow up to live on a farm, if only of the Farmville variety. All adds up to a curiosity if not real interest among my son and his young friends in getting back to the land in his generation’s homegrown way — keeping chickens in the backyard, harvesting co-op organic vegetables from a nearby locavore farm, driving a Prius. They may well be the next iteration of a hippie. I have a year or two left at most with my son before he ages out of wanting to hang with his old man at all. We spend a winter evening plotting a trip out west to the Grand Tetons, Yellowstone, Glacier National Park. This summer, I want him to see a North American glacier with his own eyes. I know the glaciers I trekked across as a young man have greatly diminished in the 30 years since I last saw them. It saddens me that my son’s son will likely know of glaciers only through his father’s memories and the history books. The chill of winter lingers over the landscape. 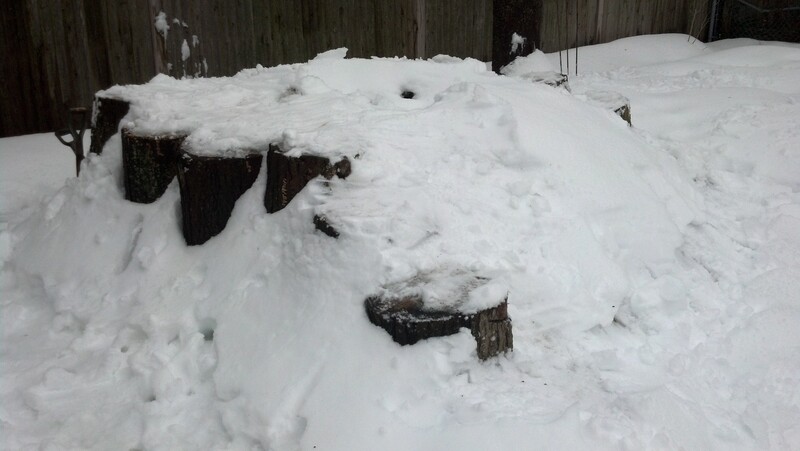 My pile remains snowbound, like a ship hemmed in by Arctic ice pack. A spell of record cold — subzero lows with wind chills much worse — has surely driven what warm life that still stokes my pile to a retreat deep within its core. This President’s Day I make due with some emergency wood chopping to replenish my supplies. I have a dwindling stack of whole logs stashed behind the tool shed, and roll one over to the flattened snow beside my pile. From Washington to Lincoln to Reagan and even Bush, splitting wood seems a particularly Presidential exercise. The grain of the maple is smooth and true, like a hardwood floor. I halve the whole log with a steel wedge and a sledgehammer, then use the sharp side of a maul to cleave off smaller chunks. The squat round piece of trunk produces a dozen or more fractionalized slivers of cordwood, enough for an evening’s fire, at least. While I’m busy splitting wood, the dog clamors up the log wall sides of the pile and proceeds to bury his nose in a vent hole. By the time I turn around to notice, he’s pawed out a patch of seagrass from under the snow. Miller, knee deep in my pile, has sniffed out something of interest while I’m busy chopping wood on a wintry Presidents Day. I don’t know what he’s sniffing out. It could be the aroma of the fermenting kitchen scraps from the last insertion two weeks ago — or he’s caught the scent of an interloping scavenger. 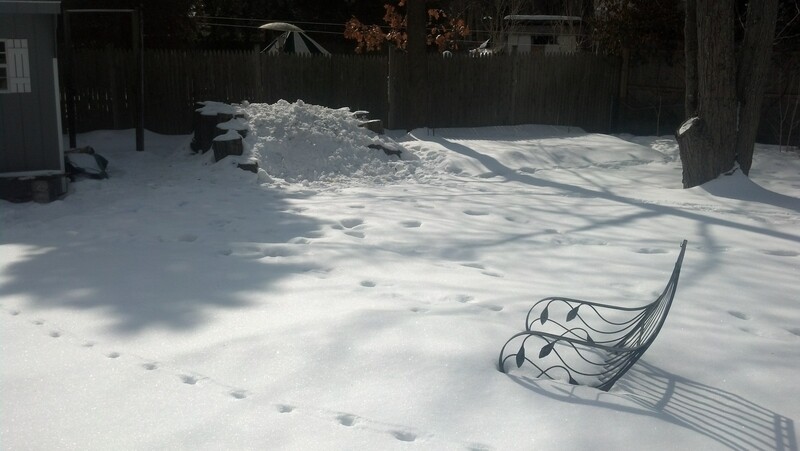 There’s been no sign of rodents around my pile of late, though it’s possible that some furry little critter from nearby – from under the tool shed, say, or from the ramshackle property on the other side of my backyard fence – has tunneled under the snow. It wouldn’t surprise me, given the extremes of weather, that a mouse or wood rat would be attracted to the warmth and sustenance of my pile. It’s happened before. 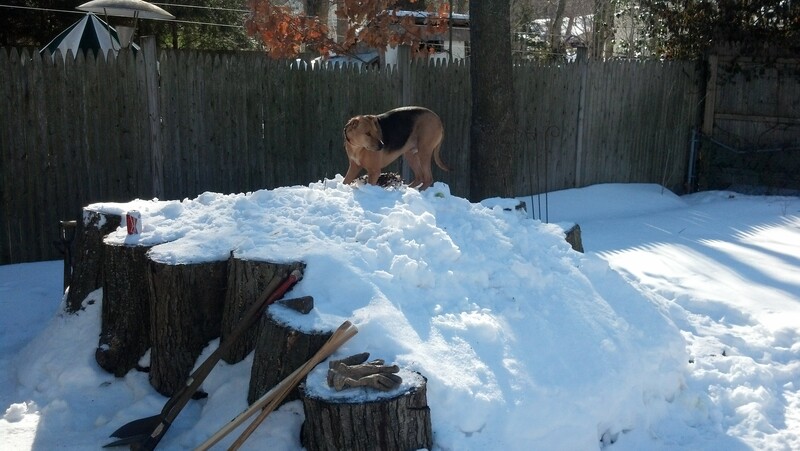 My pile is large enough to allow me to bury any kitchen scraps and such deep inside. That helps keep most of the roaming suburban varmints from nosing around my pile, though in mating season I’m always wary of skunks wondering by, mostly for the dog’s sake. A few springs back, my pack-rat of a back-fence neighbor shifted around the collection of junk in his backyard; the wood pallets on which he’d stacked all manner of plastic tubs and rusty file cabinets filled with whatnot had rotted out. Some of the diaspora of rodents that had nested underneath the yardful of junk made their way over to my pile. A round hole in the wood chip mulch along the bottom of my back fence connected to a same-size bore hole just above the last batch of kitchen scraps I’d tucked inside my pile. Pieces of egg shell and a banana peel lined the opening. Another entryway was neatly scratched out on the ground between two of the logs stacked in a wall to the side. My pile was turning into a compost condo for rats, with a 24-hour buffet there for the taking. I borrowed a slender rectangle of a live trap and set the cage alongside the log-wall base, balancing a cracker laden with peanut butter on the spring hatch in the middle of the wire cage, then raised the spring-loaded hatches on either end. A couple mornings later, the dog bounded out the back door and nosed straight to the trap, barking with keen interest. Inside, to my surprise, was a small, twittering rodent that looked like a mouse-sized kangaroo. I hoisted the wire cage up out of the dog’s reach and took a closer look. 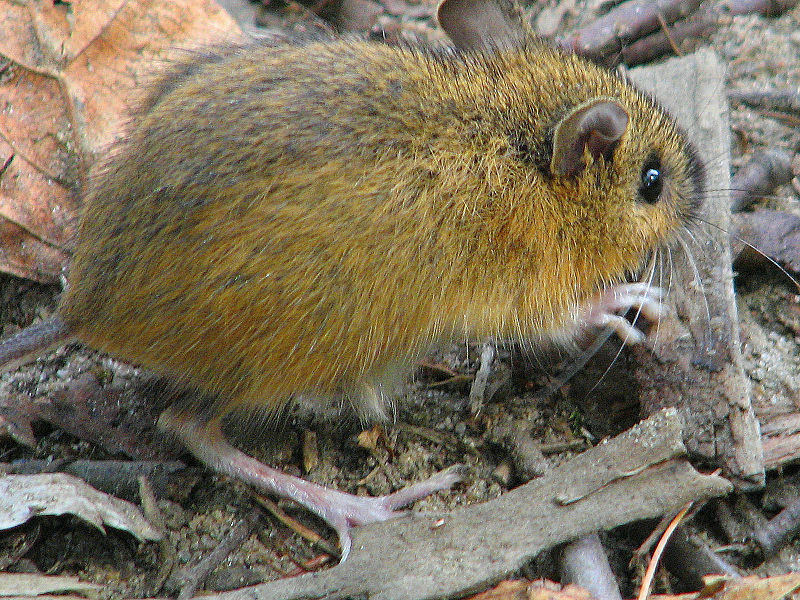 The whiskered critter had hobbit-size feet and a scrunched-over back, like a hampster. It was mousey brown, except for a white, rat-like tail. It peed through the wire under my scrutiny, and the dog’s yapping. I walked the cage across the yard and over to my car to set it in the back, figuring I’d let the varmint loose in exile when driving my son to school. I had no reason to dispatch the mammal, at least execution-style. Besides, on the 10-minute drive to his school we pass an empty lot set between the highway and railroad tracks, across a deep wooded culvert from the marshy inland area of a state beach. The state DOT uses the area to stage trucks and dump spare loads of asphalt and wood chips. The commute, of death sentence and by location, was the best I could do for my captured critter. Holding the cage a foot or so off the ground, I opened one hatch and tilted. Out popped the little brown rodent, which sprung across the weedy ground in zigzag leaps and bounds, disappearing licketty-split into some deeper weeds across the way. My son and I were startled by the hip-hop display. One of these little guys checked out my pile, but couldn’t stay. Back home, I reset the live trap, figuring my chances of capturing a mate were pretty good. “A casually managed compost pile can become a mouse magnet, welcoming rodents in search of seeds, food scraps, and places for nesting,” I read in a posting on Rodale’s Organic Life. “Mice living in a compost pile are just doing what comes naturally. Even so, their role in the spread of serious diseases such as hantavirus, salmonellosis, and Lyme disease makes mice undesirable tenants anyplace where people are at risk of coming in contact with them or their droppings. The next morning the trap was sprung. Inside was a Norway rat, big and grey and beady-eyed and without any charm. That morning, I was heading directly to work, and took the rodent with me. I don’t see pilfering my pile as a capital crime. On my way to the office I pass a small park along the Saugatuck River, a promatory of sorts among the tidal flats. I released the rat in the parking lot, expecting it to scurry into a nearby patch of phragmite reeds. Instead, it scurried across the lot and back toward the road. On the other side were houses. Before I’d processed any course of action, a hawk sitting on the branch of an oak tree overhanging the road swooped down and took a stab at the rat as it skittered across the two-lane roadway. The rodent narrowly escaped, disappearing into the leaf-covered slope on the other side of the road. The hawk took off. So did I. That was the end of my live-trapping that season; though a week or so later the dried-up smear of peanut butter on a ritz did capture a squirrel. I let it out in the middle of the yard, with the dog baiting his breath. The squirrel high-tailed it to the nearest tree, the dog nipping closely at its furry tail. In the years since, I occasionally set the trap out, catching the odd mouse or vole, and most recently a brown sparrow that had hopped into the cage. I suppose the pair of red-tailed hawks that soar along the oak-lined ridge that flanks the valley road I live on keep an eye on things; while working on my pile this past fall one of them glided over my pile with a squirrel in its talons. Some years back, while digging for earthworms to take the neighborhood kids fishing, we unearthed a fat garter snake. And even though I’ve never seen one nearby, I’d like to think a native owl has learned to perch on the limb of one of the maples overhanging my pile. I bet my pile is a honey hole for things that hunt in the night. A midweek storm has given my son the snow day he prayed for last night and me the occasion to make my way out to the pile after shoveling off the porches and driveway once more. Starting from the back patio, I angle the snow shovel in front of me like the bow of a flat-bottom fishing skiff; it tamps down the fresh snow along the trodden path so my boots don’t plunge through and allow the snow to glom onto my socks. The narrow lane of tramped snow then splits three ways – to the shed, to the stack of firewood along its side and to my pile. Paths of convenience, landscape architects call them. Entombed in its sarcophagus of white, my pile is a ghostly outline. I hardly remember what it looks like unbound by snow. The log walls that frame my pile are stacked with layered flattops of snow, testaments to the successive snows of late. Between them is a saggy crater of white with a stain of brown in the center, a good sign that my pile has not been brought to a standstill. All around melted-down midsection are deep drifts of snow. I pause to consider the foolishness of shoveling snow off my pile. After all, weeks ago I was heaping snow on top of it. My muscles already ache with the needed shoveling I’ve done beforehand, but it only takes a moment to slide the bottom of the shovel across the tops of the logs and flinging the pillars of snow from them to the side. I shovel scoops of drifted snow from the inside of the log walls and from the front flank, stripping swaths of snow to nearly the leaves. I work my way around the pile, trimming the snow from it like fat on a ham. It will be snow-free that much sooner, I figure, and ready for me to start turning it with the warmth and renewal of spring. My pile, shaved of its winter’s burden of snow. The winter’s snow has kept my composting muscles in shape, at least. Though I don’t get in much machine-aided exercise, all the raking, shoveling and pitching I do around the yard provides plenty of year-round cross training, especially for my arms, shoulders and core. Scooping a dense sheetcake of snow off the driveway or even raking feathery leaves across grass is a workout, one that I enjoy. There’s a simple pleasure to be had in shoveling snow, raking leaves, digging a ditch or mucking through a compost pile, a metronomic repetition of effort that results in a basic accomplishment. I read once that music conductors never suffered heart attacks – all that strenuous waving of hands and arms and batons for hours on end gave them heart muscles of Olympian gusto. Not that I’m calling myself a virtuoso with a rake and a pitchfork, but I can only hope my efforts with my backyard instruments count something for my heart health. But I digress, as my pile often causes me to do. My main purpose in clearing a way out toward my pile was to stash another week or so’s worth of kitchen scraps in the tool shed, joining two other bag-fuls now in cold storage. The path of convenience through the snow that I hardly ever bother with is to my tall garbage can I keep behind a large bush on the side of my house. With virtually all of my food waste scraps destined for my pile by way of the “Hooch” bucket container I keep in the kitchen, I fill up the kitchen trash can only every couple of weeks; it’s mostly plastic wrappings, paper packaging and soiled paper towels. Except for a few weeks after this past Christmas. My parents thought that they had found the perfect gift to help spiff up what they consider a backwards lifestyle by sending me a fancy new Keurip coffee-cup machine to replace my sorry old Mr. Coffee. The big box came with a sampler pack of coffees. I admit, the coffee was good and convenient, but it killed me to pluck out each punctured coffee cup and toss it with a clang into the kitchen garbage can. Once, I tried to peel the plastic top off to spoon out the coffee grains like crème caramel. The cup out-engineered me. When my parents ask how I’m liking my new coffee machine, I lie. It sits on the counter, unplugged. I’ve gone back to my old setup, which gives me the morning jolt I need and the rich dark coffee grounds I know my pile wants. The over-engineered coffee maker sits unloved and unused next to my kitchen bucket ready to be emptied. I’m not alone in dissing and dismissing K-Cups, at least on composting grounds. The inventor of the thing, which really is a better mouse trap, at least in terms of a drug delivery system, regrets that he ever invented them. “‘I feel bad sometimes that I ever did it,'” John Sylvan told The Atlantic in an interview. “Why? Because the K-Cups are bad for the environment — they are disposable and not recyclable. “Sylvan originally envisioned the cup-like pouches that brewed a single serving of coffee for offices, where people want different brews. 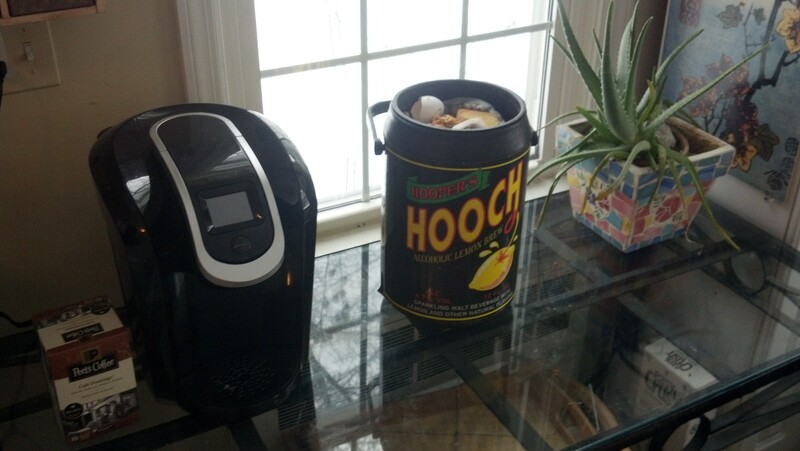 But the technology caught on, and Keurig Green Mountain (GMCR) brewers are now on kitchen counters everywhere. “That means more and more K-Cups are being used — and thrown in the trash. “Sylvan isn’t in a position to do much about the problem. He sold the company for $50,000 in 1997, and it’s now owned by Green Mountain, the brewing company. “‘I told them how to improve it, but they don’t want to listen,’ Sylvan said. There’s also this recent news, from the German city of Hamburg: “The German city of Hamburg has banned coffee pods from government-run buildings. In an attempt to become more environmentally friendly, the city said it will no longer spend taxpayer money on products that don’t meet its high sustainability standards. A spokesman for the city said the pods contain 3 grams of waste for every 6 grams of coffee. Soon, my coffee-cup dispenser will make its way to a closet, gone but not forgotten when the folks come to visit. Coffee grounds and filters seem right at home with my pile. Continuing inside with my own snow-day compost googling, I find shared grief about another composters’ pet peeve. Those little stickers on supermarket fruits and vegetables. “The most bedeviling problem for the company that turns most of the Puget Sound region’s kitchen waste into compost is on a piece of fruit. Almost every piece of fruit. “It’s that little sticker that tells you whether the fruit, and many kinds of vegetables, are organic, where they came from and which code a supermarket cashier should punch into the cash register. “At Cedar Grove Composting, which every year turns about 115,000 tons of food and other waste collected from restaurants and home kitchens into dark compost for both gardens and larger construction projects, those stickers are a huge headache. “In what seems something of a fool’s errand, the company distributes sheets that look like Bingo cards. Fill one with 20 fruit stickers, and you get a free bag of compost. So far, they’ve given away about 800 bags. “Recently, one went to Juanita Chase, 54, of Lynnwood, Wash. At first, she collected the stickers because she just wanted a free bag of compost. When she learned the stickers were such a problem, she became a little evangelical about it. I always try to peel off the stickers when I’m cleaning or peel store-bought food. Usually I stick them on the side of the sink, then tease the annoying things off my thumb with a flick of the finger into the trash can. Still, I’m always amazed by how many crop up when I’m turning my pile. Even more surprised to look down to the grass when picking up a Frisbee or tennis ball for the dog and spot one flung there with a shovel of humus, hanging on like plastic flotsam in the sea. Millions upon millions of fruit stickers add up to “sticker shock” for the consumer waste stream. Today is Wednesday. Ash Wednesday, I realize, after seeing a coworker with a smudge of gray ash on her forehead this morning. I’m not Catholic, so I have to look up the fact that this day marks the seventh Wednesday before Easter and the first day of Lent, on which many Christians receive a mark of ashes on the forehead as a token of penitence and mortality. I take the afternoon off as a sick day, citing the winter bug going round the office — and snagging a bag full of office-paper shreds on my way out the door, personal penitence for playing hooky so I can go home to check up on my pile. The predicted snow did come and go early this week, leaving a few inches more of powdery, not hardly enough to shovel off the driveway. I see my pile has also shrugged off the latest covering, etching craggy vent holes across the top, which roughly correspond to where I buried the last insertion of coffee grounds and kitchen waste. There’s not much I can do for my pile at this point. Well, some. After etching a pee into the drift of snow along the back of my pile, I duck inside the shed to retrieve the hanging bag of frozen kitchen scraps; I add a fresh bucket from the kitchen and put it back in cold storage, along with the shredded paper. Next, I clean the fireplace and then sprinkle the few scoopfuls of fine gray ash and bits of crumbly black charcoal across the top of my pile, which again sags between the log walls, beaten down by the leaden weight of winter. Wood ash is in abundant supply this long winter, and the dusty detritus of cozy fires inside is the only recent addition to my pile. Ash and charcoal bits contain lots of desirable trace nutrients and they balance the acidic bent of the leaves and grass. What’s more, virtually all of the carbonized remains are from the maple tree that I had taken down this past fall, not 20 feet away from my pile. I’ve spent the fall and early winter splitting the logs from that tree into cordwood for the fireplace. A smattering of ashes on my pile, tossled with melting snow. “Earth to earth, ashes to ashes, and dust to dust in sure and certain hope of resurrection to eternal life,” goes an Anglican burial prayer. All ground is renewed by the ashes of what grows on it and above it, and adding ash from the maple that once spread its branches over my pile and its roots underneath it closes a very local feedback loop in the cycle of life that is my backyard. So there is a certain symmetry to the sprinkling some of the final remains of the maple tree upon the compost heap that long nurtured it. Just as its leaves have contributed to the soil that surrounds it, so, too, will the ashes of its limbs and trunk. Besides, I like the look of charcoal gray on white, the poetic juxtaposition of spent fire on frozen water. “Plants, animals, insects, and people are all inextricably linked in a complex web of interrelationships with air, water, soil, minerals and other natural resources playing vital roles. Compost, too plays an important role. There is a cycle, a continuity to life,” I read in The Rodale Book of Composting (Rodale Press, 1992), the bible on the subject. “All of the environmental problems we face are rooted in a failure to appreciate the life cycle and to keep it intact….Composting is one way to work within the life cycle in the furthering of our welfare. “Compost is more than a fertilizer, more than a soil conditioner. It is a symbol of continuing life….The compost heap in your garden is an intentional replication of the natural process of birth and death that occurs almost everywhere in nature….It is ironic that composting, the oldest and most universally practiced form of soil treatment in the world, should today be claiming so many converts. Perhaps this is nature’s Restoration–a reaffirmation that people do, indeed, live best when they live in harmony with nature. In hopes of resurrecting my pile, or at least nurturing its inner life toward the eternal promise of spring, I grab the hay pitchfork from its roost in the shed. First I scrape the tines up through the thick crusted snow on the north-facing front. Circumnavigating the log walls and sagging back fence between them, I thrust and parry my way through the congealed snow, collapsing the meltwater caverns and stabbing into the cold hard crust of leaves. It’s like punching through a sooty snow globe. I work my way round my pile with the pitchfork and soon its top covering is a corduroy of granulated chunks of sooty snow. It’s about four inches thick, less than the untrammeled snow field of a backyard that surrounds it. My pile on Ash Wednesday, seven weeks until Easter! After a series of snow events over the past six weeks, a day of rain is now on the horizon. I’m hoping that by scrambling the snow and ash cover atop my pile, it will be snow-free sooner than the rest of the yard. To spur things further along, I grab the rebar, hop atop the ice-capped log walls and thrust the rod down through the chopped-up snow and frozen leaves until it tings against the rock-hard ground underneath. The end of the piece of ribbed iron is warm to the touch. My pile is primed for a resurrection that will come as much from within as with the warming sun.